In November 2012 me and my wife were on our honeymoon in France. 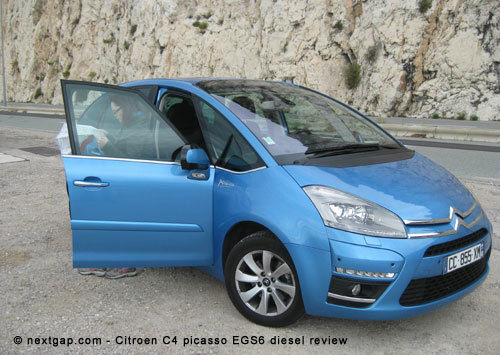 We visited south France and rented a Citroen c4 Picasso, a Diesel EGS6 (electronic auto gearbox). We drove about 1000 km on it, throughout a week. We had one rainy day but the rest were sunny. We drove in town and outside and on a few unpaved trails as well. My relationship with the Citroen was a love and hate relationship from minute one. This is overall a good car and it’s obvious that Citroen went out of it’s head to build a good family car. The result is not quite good as they planned and I’ll explain why. Starting to drive: the seats are real comfortable, and the car is equipped with a gearbox selector handle, located just above the steering wheel. Naturally, you’d like to pull the handle all the way to drive, but Citroen weirdly ordered the gears with M (manual) being last choice. So most of the time you’re pulling the handle too far and then pushing it back for D (drive), it’s pretty annoying and because the handle is very delicate and small , getting used to it, doesn’t help, you still miss the D most of the times. Why not drive in manual? Maybe it could be practical in 1960 with those 4 gear boxes, but this 6 gears is not practical at all, and pushing the left and right handles for up/down shifting, is the last thing anyone wants to do with an automatic gearbox. Another thing that bugged me is that when you’re stopping up hill, any release of the brake will cause the car to drift backwards, even when it’s in D (Drive) mode. After I returned the car I read in some article, that there is a button that starts a function called “easy move”: the parking brake remains on for up to two seconds after the brake pedal is released. In theory this gives the driver enough time to switch from brake pedal to accelerator without having to worry about an uncontrolled downhill movement. The uphill/downhill start function takes effect on slopes of 3% and over. Not surprisingly, the button is located in a place you can’t find if you don’t know that car well. In any way, I would appreciate if it wouldn’t drift backwards without having to engage an electronic system. A scenario: you’re parked uphill, you got one car behind, one car in front and only a few c”m to maneuver through. When you press the gas pedal and suddenly the brake disengages, the car will probably move forward more then you intended it to. I conclude that, from noticing how the electric parking brake disengages in normal use, when you first start the car and drive. Citroen equipped the Picasso with a rear, side and front distance sensors. That’s very good, giving the fact the front of the car ends in an angle that makes it impossible to see the front at all (I’m 1.81 c”m tall and still). So you rely on the sensors that are pretty annoying (all beeps are annoying, in any car…) although they make a good job warning you from front-back-side hazards. Another criticism I have is that the sensors alert you with beeps along with a yellow line on the screen, that tells you which side of the car is close to an obstacle. It does that with lines in different colors that reflect the proximity. It starts with a yellow line, then another yellow line and then a red line. Problem is that besides being frightened by the red line, you can’t really know for sure, how far you are from the other car/wall/whatever. Does a red line mean I’m 30 c”m close? 20 c”m? zero? Citroen better have used numbers instead of colors. The most annoying thing in the Picasso is the gearbox. I don’t know if Citroen engineers designed it to make the driving experience feel like a manual gear box (they surly succeeded…) and I’ll explain what I mean. A good automatic gearbox should shift gears flawlessly and in a linear kind of way, with no pauses between gear shifts, up or down. The Picasso gearbox pauses with every gear up change. This is probably the most annoying gearbox I’ve ever drove, even more annoying than the Citroen BX from the 90’s. For me it’s a deal breaker and this gear is tiresome in city driving. On the contrary, in highway speeds it’s a delight. Handling and engine pull are one of the good things in this car. The diesel engine pulls hard and has excellent roll-on performance, that means it makes car passes easily even in high speeds of 120-140. Car handles superb and with no squeaks from the plastics. The car was steady even at high speed curves. Front light is good and the high beam is great. Another great feature in this car is the moving head lights. When you’re taking a turn, the lights will move and point to where the steering wheel points. That means that you can see the turns better, a feature that helped us on at least one very dark night, driving on a mountain onto the town of Les Baux-de-Provence. The Citroen engineers weirdly designed the air conditioning console as a tiny 5 X 5 c”m area, located low, left of the driver , on the side. So here’s a scenario: you’re driving on the highway, it’s 130 kph speed limit, rush hour, it’s raining and the front window starts picking up fog. The passenger can’t help you at all cause the console is located on the driver’s side. So, I’m driving the car, and to set the AC buttons , I need to stop looking at the road and start staring at these tiny buttons with those tiny illustrations. Feeling them does’nt work cause they all feel the same…I can’t stop or slow the car cause there are dozens of cars behind me. If it wasn’t a real risk of a crash, it was funny. Another thing that doesn’t make sense is why can’t the driver cancel the dual AC unit, that is, cancel the ability of the front passenger to set different temperatures. For ex, your passenger have set his temperature on his side and after a while gets out of the car. As I found out, I couldn’t manage to cancel the temperature set on his side. Maybe there’s a way (manual was in French only) but it sure was not intuitive, cause I tried pressing on all buttons, and nothing worked. In my Toyota for example there is a button named “DUAL”, clicking on it, cancels the passengers AC settings and lets the driver control all AC settings. And another thing (…) setting the AC to circulate the interior air (rather than draw air from outside) is set by a button. Problem is, and unlike my Toyota, this setting changes every time you use the defogger or something like that. So unless you remember to reset it again, you’ll set it back, only after you start smelling smoke in the cabinet. On the bright side, the Citroen interior is quiet, and you can listen to low volume music on highway speeds and still be able to talk to other passengers without raising your voice. The same engineers designed trays that open for the back passengers, to hold food and drinks, very good. The back compartment is big enough for a few large suitcases. The left light that opens when you open the rear hood, can be pulled out and used as a rechargeable flash light, very useful for camping! Bottom line, as I said before, this car has a potential to be one of the best family cars out there, if Citroen engineers would rethink a few things. If you want to see the places we’ve been to, on Google maps, click here.